After more or less taking a weekend off, the box office is back in force with this holiday season's best hope for a family blockbuster, as well as one of the stronger December candidates for Oscar hopes. Somewhere, a New Line executive is cursing himself that J.R.R. Tolkien only wrote The Lord of the Rings in three parts. Instead of those films, he could have made the potentially equally lucrative seven films out of the Chronicles of Narnia novels by Tolkien contemporary C.S. Lewis. 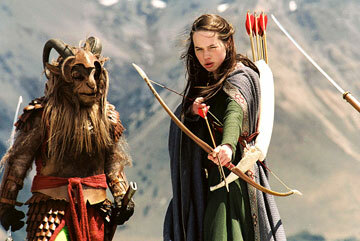 The first of these is this weekend's headlining film, The Lion, the Witch and the Wardrobe. In it, four children, moved out into the country for safety during World War II, stumble upon a portal to a magical world called Narnia, filled with talking animals and magical creatures, which is locked into perpetual winter (but never Christmas). It is ruled with great terror by the White Witch, who fears the coming of a talking lion named Aslan (sounds rational, really) that once upon a time ruled the land, but has not been seen for many years. While the witch courts the favor of the children, a great battle between the Witch and Aslan is brewing, with the sides representing, quite literally, good and evil.